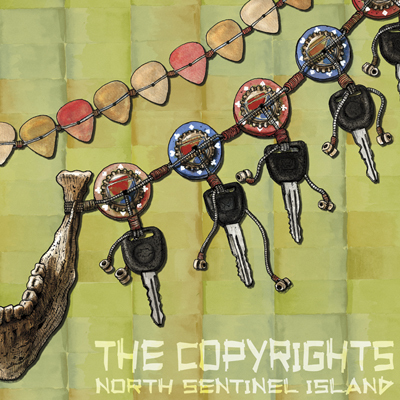 The Copyrights "North Sentinel Island'"
It's hard to believe it has been eight years since The Copyrights released their first album way back in 2003. Pop punk had long since burst onto the scene, into the big leagues and retreated back to the basements by then, leaving behind the last of the diehards. Among those diehards were The Copyrights. Still teenagers then, these guys took everything good about the old style and made it new again... and better than ever. They were among the first of a few young bands to really take pop punk, turn it on its end and redefine the genre. Eight years, a slew of singles and five full length albums later they are still at it. They continue to define and redefine the genre with each successive album. No two Copyrights albums sound exactly the same, but they are all unmistakably Copyrights through and through. Bands like this make sticking to the music you love despite all of its lows worth it every day. North Sentinel Island is the best Copyrights album to date. But ask any Copyrights fan and they will have said the same about each new album when it came out. They aren't wrong - this band just gets better and better with each new record.